Work is changing as you know it, whether you plan on working for yourself or someone else. 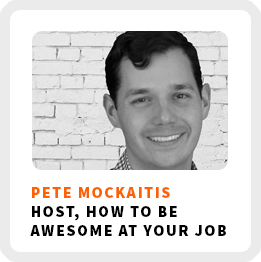 Pete Mockaitis, host of the popular How to Be Awesome At Your Job Podcast, joins us to share how to respond more effectively to our rapidly changing economy by learning how to be awesome at your professional development. I was on his show this past fall talking about the 3 most important life skills to future-proof your career. Pete is a speaker, coach and trainer, helping people like you take charge of your career, learn more at Awesome At Your Job. How to think about building multiple revenue streams by focusing around a similar idea. How he guided his own professional development early on in his career. Pete’s definition of consulting and how anyone can explore it through their own areas of expertise. The most common mistake people make managing their careers. Core work activities + habits: 1) Keep cranking out the podcasts. 2) Have coaching calls with people. 3) Grow his audience for the podcast. Regains focus by: Jumping on his trampoline. 90-day goal: Double the podcast listenership.